Arbroath cut slumping Forfar's lead at the top of Ladbrokes League Two to a point after beating Berwick 2-0. While the leaders failed to win for a sixth successive game, Arbroath saw off Rangers thanks to goals from Steven Doris and Martin Scott. Doris struck from the spot in the 38th minute after Bobby Linn was fouled in the area and Scott made sure of the points in stoppage time. Forfar needed a 71st-minute header from James Lister to draw 1-1 at Elgin as they drew for the fourth time in their last six outings. Darryl McHardy had nodded the hosts ahead four minutes into the second half but Elgin were unable to stop a four-match winless run of their own. At the bottom, Clyde earned their first league win since November with a 3-1 success against Edinburgh City. 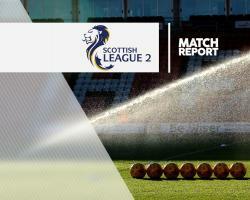 Clyde, who had picked up just three points from their last 14 games, fell behind to Lewis Allan's first-half strike. But Matt Flynn levelled six minutes after the break before Peter MacDonald's double took Clyde above Edinburgh and into eighth spot. Stirling's winning run is up to five matches after Darren Smith's 74th-minute earned a 1-0 success that halted Annan's sequence of five successive victories. In the day's other game, Michael Bolochoweckyj and Matty Smith were on target as Montrose won 2-0 at bottom club Cowdenbeath.